Petit fours are tiny cakes iced in pastel colours. They’re beautiful, festive, decorative, and hard to make. 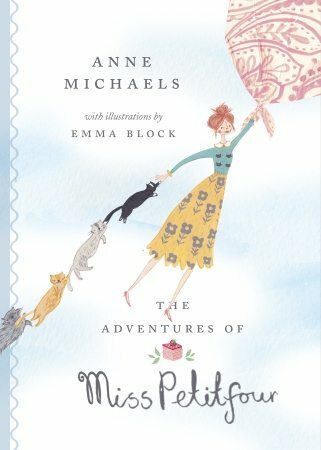 The Adventures of Miss Petitfour is a collection of five stories decorated with delicious language and fanciful illustrations that reveal the hand of a master chef of words. Miss Petitfour lives with 16 cats, but she’s no crazy cat lady. She’s young and stylish, popular among her village neighbours, and devoted to the minor pleasures of life, such as reading, teatime, dancing, and chatting. She also has a talent for turning herself into a kite. On windy days, she grabs a tablecloth for a sail and lifts off (echoing Mary Poppins and her umbrella), the line of her cats – joined paw-to-tail – functioning as the kite’s trailing ribbon. The resulting adventures are at the whim of the winds, as the unlikely airborne troupe travels wherever a gust takes them. Whimsical is the predominant flavour here and it’s a hard one to sustain, but Anne Michaels pulls it off with aplomb, injecting just the right amount of oddness to balance the sweet. For example, village bookseller Mrs. Collarwaller likes books that contain facts, such as “the kind of food ostriches like best, or the history of doilies, or all the movies in which the Isetta bubble car appears, or important details concerning the invention of shoelaces.” High-fives to publisher Tundra Books for not insisting the author remove the reference to the Isetta bubble car. Readers of Mrs. Collarwaller’s ilk can look it up if they’re curious (as I was). The book is wrapped up in a perfect package, with a pink-ribbon page marker befitting something to be read in small bites, paisley endpapers that remind us of Miss Petitfour’s tablecloth, generous white space, lots of playful front and back matter, and spot- and full-page illustrations in icing colours. Petit fours were traditionally made in a small oven next to the main one (“petit fours” means, literally, “little oven”). Michaels has written some other books – rather well-received – for adults. Here’s hoping she forsakes the main oven again to craft another convivial offering for the young.